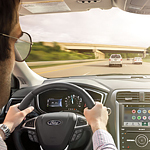 We here at Fox Ford Of Waynesburg are thrilled to greet Ford Co-Pilot360, Ford's dynamic suite of driver-assist technologies. The suite is slated to be standard on all new Ford models by late 2019. The technologies are each incredible in their own right. Here are two to give you an idea. Auto High Beam toggles between high and low beams so you can keep your hands on the wheel. Auto High Beam detects oncoming headlights up to 2,000 miles way, switching to low beams to prevent blinding oncoming drivers and back to high beams for optimal illumination in low-light driving conditions. BLIS works by radar, detecting cars in your blind spot as you're on the road. BLIS alerts you with a light in your side-view mirror, which gives you an opportunity to change lanes or merge at the right time. BLIS also detects traffic that crosses behind you as you're backing out of a parking spot, driveway or garage.